A high school student describes how she started a dance class for children with Down syndrome and in the process discovered the power to communicate, connect and learn through movement. What happened next transformed both teacher and students. I have always loved to dance. But it wasn’t until I created a class for kids with Down syndrome that I realized dance is not just an activity, or a sport, or even an art. Dance is a language – and it can be used to help others. For six years I have competed in a dance competition called Kids For Kids- Dancing For Life, the proceeds from which are dedicated to children in need. Each year, the children and families who benefit from the competition come to speak with the dancers so that we can hear and be inspired by their stories. In my life, I have also been inspired by my grandmother, who has not only dedicated herself to helping people with special needs, but now, even as she struggles with Parkinson’s disease, continues to look out for others. Both my grandmother and Kids For Kids helped me to realize that dance is not just about the individual dancer’s performance, or even about the audience’s experience – but that dance could be used to help and positively impact others. Through movement you can tell stories, communicate a message or share an inspiration that can impact others around you. At the end of my freshman year of high school, I formulated an idea for starting a dance class for children with special needs. I emailed my dance teacher at school and she was enthusiastic about my idea. She has twin boys with Down syndrome, and so she offered to help me by reaching out to parents she knew in the area who also have children with Down syndrome. During that summer and the first few weeks of school, she and I planned for the class, scheduled dates, found participants, and worked out times. In my excitement to begin, I meticulously crafted a lesson plan, complete with printing multiple copies on card stock paper. On the first day, I walked into the dance studio forty-five minutes early with my lesson plan in hand. I had never taught a class before, but I was convinced that I was prepared for everything. I had even brought colorful plastic dots to lay out on the floor in a circle, so that when the kids came in they could each sit patiently on a dot and wait for the class to begin. When the first few children came through the door they quickly slipped out of their parent’s hands and spread out around the room. A colorful blur went whizzing past me, and when I turned around, my perfect circle of dots had been destroyed. One child had thrown a dot, and another was putting a dot in his mouth. More kids rushed in with their parents, and the world became a slow motion buzz of noise. At a loss, I fiddled with the stereo, certain I had made a mistake in thinking I was ready to teach. When I finally worked up the nerve to start the class, my voice was shaky and high pitched. Though one or two of the children turned around to look at me, none did what I said. It dawned on me that most of the children might not be able to speak yet. My entire lesson plan shriveled before my eyes. I felt helpless as I walked back to the stereo. As a last resort, I turned on one of the classical music pieces I had picked out especially for the class, and returned to the children to start a game. I put my hands on my head and encouraged the children to do the same. In that moment, the most incredible thing happened: the kids watched me move and then responded. I waved an arm, they waved their arms. I lay on the floor, each child lay on the floor. I did a spin and they twirled around in their own little circle. Each time I moved, they followed my movement and smiled. After that first class, I based my lesson plan around “follow the leader.” The children communicated with me through movement. We spent each class dancing alongside one another. 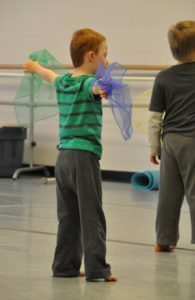 Every class consisted of dancing to songs, using props, and engaging in creative movement activities. I saw that it gave the children the opportunity to communicate in their own unique ways. Through this experience, I discovered not only how important communication is – but also that communication is not the same for everyone. We all need a way to express ourselves. For these children, dance is the perfect language. I have learned from the parents that classes like this one are rare. Most children with special needs do not have a class with kids who are just like them. Instead, they are put together in one big group. 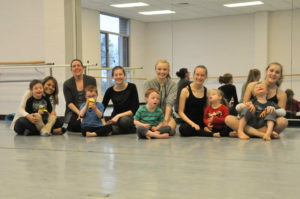 Our dance class is specifically for children with Down syndrome, where they can dance, learn, and communicate and feel secure with others who are just like them. It has also created a community of parents, where they share experiences and encourage friendships among their children. The kids have grown to know and respect one another; they even now cheer each other on. The class has grown since its beginnings. The first year, there were about four children per class. Now, after three years, we have about ten. This year, we also added a music component to the program. 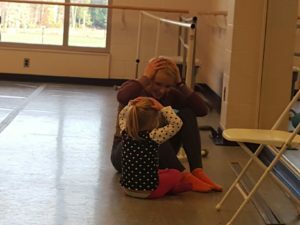 Each month, on alternating weeks, a member of the music faculty and a music student teach a music class that has a similar structure to the dance class. In Dig Where You Are – a book by Nan Alexander Doyal – I learned about eight qualities that efforts like ours have in common. Three in particular describe our dance program. Our class has “made it safe” for children to express themselves through dance in a room full of kids with similar experiences. It has helped to “build a community” of children and parents. The effect of shared experience in this class will be long lasting. The most important lesson I have learned from creating this class is to “teach what you learn and create a narrative”. Not only have I learned immensely through teaching the children, but by learning to communicate through dance, the children have learned from each other too. 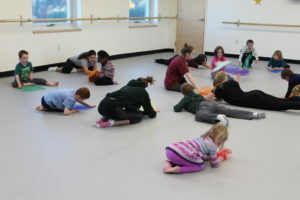 The Dance Program for Children with Down syndrome also gives other dance students in my school a chance to get involved through assistant teaching. Through this they earn community partnerships credit for school while having a chance to work with the children and experience the learning process that I have. When I graduate, I will pass on the responsibility for the class to one of my fellow dancers to ensure that this program continues. Creating and teaching this class has inspired me to continue to help people through movement. Through the arts, these children have been able to find their voice, communicate, learn and grow. They have taught me that dance is a language, a way to give people a voice- and I hope to give a voice to as many people as I can. Garet Wierdsma is a senior at The Ethel Walker School in Simsbury, CT. In 2015 she founded The Dance Program for Children with Down syndrome. Garet is Head of Community Partnerships at The Ethel Walker School, where she organizes school outreach programs and serves as a member of the student government. She plans to study dance and neuroscience in college and hopes to continue writing.